Yeah, Aang-Katara, that romance. Some stuff developed along the way, and we're glad some fans are more receptive to that element of the show, but it was in the DNA of the thing from the start. 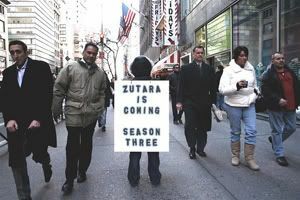 I've said this before, but again, I see nothing in that statement that eliminates the possibility of Zutara. Yes, there have been elements of romance between Aang and Katara (although I would argue that that romance has been mostly--not entirely--but mostly one-sided). But why does having a romance involving Katara and Aang mean that there can't be elements of romance between Katara and someone else? I've shipped Harry/Ginny since Book One.